A solicitor has dressed up as Legally Blonde’s Elle Woods. 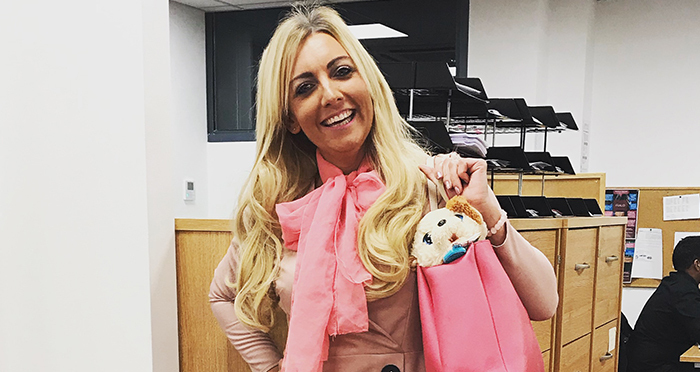 Keeley Lengthorn, a family law partner at 27-office outfit McMillan Williams’ Bexleyheath branch, chose to dress up as the whimsical character at a fashion event at Middle Temple’s grand hall on Monday. Speaking to Legal Cheek, Lengthorn said she chose to dress up as the ditsy blonde because she’s “a massive fan”. Being blonde, a self-confessed lover of pink, and a lawyer meant she “ticked all the boxes”; portraying Elle was the perfect persona for Lengthorn, who admitted she has been referred to as the fictional lawyer on quite a few occasions. The focal point of the evening at the Inn, known as ‘Law in Style’, was a lively debate on the ‘best fictional lawyer’ where ten real-life lawyers made submissions on behalf of characters including Harvey Specter from the American television series Suits, Atticus Finch, the lawyer in To Kill A Mockingbird, and Mr Jaggers of Great Expectations‘ fame. Coincidentally, it was the Elle Woods character who won the debate. A cult classic among law students, Legally Blonde follows the exploits of Elle Woods, played by Reese Witherspoon, at Harvard Law School. A 2003 sequel to the hit chick flick sees Elle travel to Washington DC on a mission to ban animal testing. A third instalment is apparently in the wings. Law in Style isn’t Middle Temple’s first fashion-related conquest. Last month, we reported that the prestigious Inn’s library is currently hosting an exhibition explaining the origins of court dress. I recognise her firm from this recent article. Partners in that firm should be hauled before the SDT. Curiously enough, two of the characters named in the judgment have just left the firm. Are you currently in the job market? This reminds me of the musicians who found themselves in concentration camps, and were required to play for their captors. The forced smiles, the complete lack of humanity, the deflection away from the evil that pervaded everything around them. I wonder if anyone went to this event dressed as Lord Harley of Counsel? Most famous fictional lawyer on this site, surely? He is on the roll and is therefore a real lawyer!!!!!!!! No, it got removed because it ruined the sheen of this transparently paid-for propaganda piece for a firm that was exposed as wholly toxic. Brilliant scoop guys. Amazing article! I mean, how someone could think anyone else in the world has any interest in this is fantastic! Even the lady in the picture looks surprised! Next week: “man occasionally wears a tie to work”. Why do barristers wear wigs and gowns?